So are you wondering why you haven’t been getting outstanding, creative ideas from your team when brainstorming? Well it’s all about starting with the people involved. And when we say ‘people’ we mean the actual number of people in the room! Put it this way: more isn’t necessarily better when it comes to brainstorming. Consider what we’ll call the ‘pizza rule’. 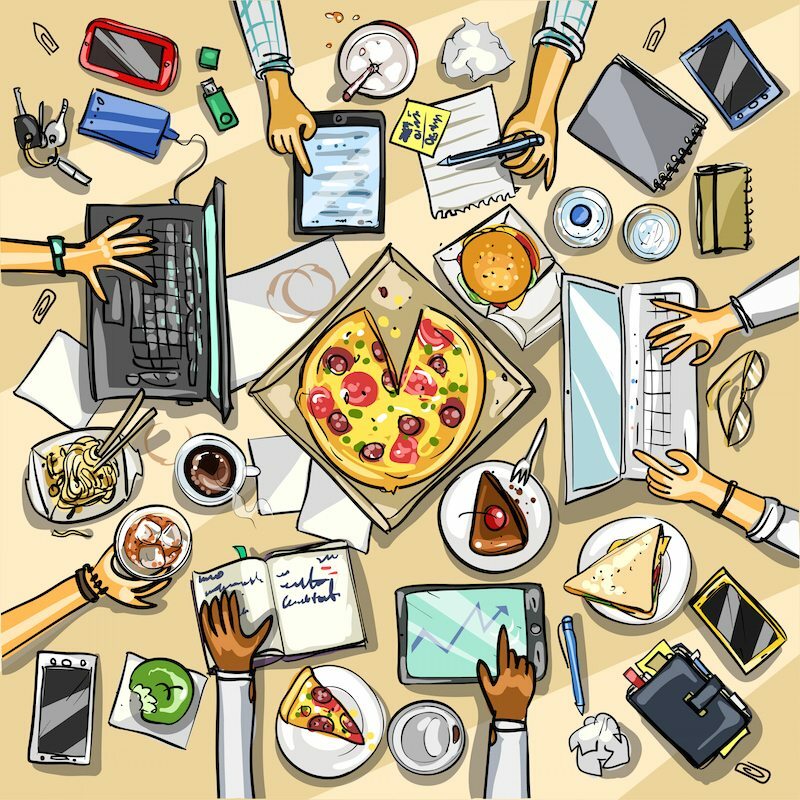 Never invite more people into a brainstorm then you could feed with one single pizza. Whenever you break that rule then your meeting won’t be as productive as it could be. If you’re wondering how ‘hungry’ those people in the room with the pizza are, lets say they are about average on the scale of starvation. This means you could hold a great brainstorm with anywhere from three to six people. It’s a fairly simple rule of thumb, right? Right. 1) Mix it up with whom you invite to the brainstorm. If you’re on a team that spends most of your time together i.e. going to team meetings together, sit next to each other in the office, and take lunch together … it shouldn’t come as a huge surprise when your ideas start to lose that uniqueness that you crave. Try inviting new people from other teams to your brainstorms — people with different skill sets and experiences to help get you out of your rut and see things in a new way. It’ll give you that great mix of new perspectives and contextual knowledge that’ll help you land on ideas that are both original and doable. 2) Keep the meeting to just over 20 minutes. Ban all banter. It may be less exciting but it’s a sure-fire way to stay on topic and get the best results. Ban all laptops. If one person is focussed on their laptop screen rather than the brainstorm session it can through the whole meeting out of whack. Everyone needs to stay present in order for this to work! 3) Provide a brief to participants with ample time before the meeting. “Ample-time” doesn’t mean the day of or even the night before. You need to provide information at least two business days in advance so your team has a chance to be prepared. A million things can crop up during the work day so the more notice you give the better your results. Additionally you’ll want to explain what the ideal outcome of the meeting looks like. This will help people come into the meeting understanding the what you’re all trying to do. This minimises wasted time at the beginning of the meeting to explain to everyone the purpose—they already know. 4) Tell everyone to come prepared with ideas. Great ideas take time to develop. They may pop up during your morning run or in bed late at night, this means just because you’re having a brainstorm doesn’t mean people are going to have some wonderful suggestions. Explicitly ask people to think of some ideas beforehand. Because your team has had enough notice they’ll be on the look out for those great ideas and write them down in preparation for the meeting. This will allow the meeting to start off on a great note and continue to flourish from there on out. Try giving examples if you’re running the meeting to open the floor and make everyone comfortable sharing their thoughts. 5) If an idea isn’t right just say no. We aren’t saying that you need to say ‘no that’s a terrible idea’. Just say no and move on. When you’re working with minimal amount of time it’s essential that you make the most of what you do have. Don’t continue to tip toe around a bad idea because you’re afraid to hurt someone’s feeling. If you’re running the brainstorm then you need to keep everything on track and part of that responsibility is quickly identifying bad ideas and moving forward rather than wasting time. 6) Remember bad ideas are okay. Sounds contradictory yes? Well, not really. Yes, you need to eliminate bad ideas, but you should make everyone feel good that they had an idea. Everyone has a bad idea sometimes, even you. So if you’re idea that isn’t up to par, just say it to the team. You’ll also want to ask them to speak freely because frankly, sometimes you can’t tell when your own ideas are bad and you’ll need your team to tell you. There is no room for someone’s ego in a brainstorm. Remember in school when the teacher would tell you that you can write on any topic and then suddenly you couldn’t think of a topic? This is sort of like that. The more resources and opportunities you have the less your creativity will flow. Lay out the constraints you’re working within in terms of goals and resources for executing any idea you come up with. Then, try to see those as opportunities for creativity instead of roadblocks that make it impossible to come up with a good idea. If a silence befalls the team don’t feel it necessary to prattle off everything in your head just because you’re uncomfortable. In a good brainstorm, silences are when people get thinking done — either about their own idea or how to build on their teammates idea. 9) Try skipping the in-person meeting. Let’s be honest, time doesn’t always allow for face to face get togethers when the whole team is working towards a deadline. Try going modern and holding a digital brainstorm. Don’t worry it’s not a fancy as it sounds. Essentially you’ll need to send the brief around the office so everyone is on the same page as to the project and its goals and then set up a file on the server for everyone to add all of their ideas. This way people will be able to participate on their own time, like when they actually have an idea and not just when the meeting happens to occur. You may get better results from this format. It’s important to give everyone a time frame for when the brainstorm needs to be completed so everyone has a chance to participate. 10) Be prepared to pursue absolutely nothing that came out of that brainstorm. Don’t feel like you have to choose and follow through with an idea just because you had a brainstorm. It’s fine if the brainstorm didn’t come up with any great ideas, working collaboratively for a creative purpose is never a waste of time. What is a waste of time is if you pursue an idea that isn’t worth doing. Just because something is the best of the worst doesn’t mean it’s good. Spend some time to reflect on your own why these ideas weren’t successful and determine if any could be saved for a future purpose. You can always try a different brainstorm format if need be or hold another meeting after everyone has had a chance to get away from the idea for a bit.